In the present study, the experimental model of Mycobacterium leprae infection in the foot pads of BALB/c mice was used to investigate the effects of BCG administration on tumor necrosis factor-alpha (TNF-α) production and granuloma development. It was observed that mice intravenously infected with BCG 7 months after M. leprae inoculation into the foot pads presented a more effective mycobacteria clearance, revealed by a significant reduction of BCG-colony forming units in the spleen and by the reduction of acid-fast bacilli (AFB) in the foot pads. BCG infection at the peak of M. leprae infection also modulated the granulomatous response to M. leprae by converting mononuclear granulomas into an epithelioid-cell granuloma. Furthermore, lower TNF-α serum levels were detected in M. leprae-infected mice when compared to mice infected with M. leprae + BCG. An analysis of the TNF-α gene expression in the spleen by semiquantitative reverse transcription-polymerase chain reactions (RT-PCR) demonstrated that co-infection with BCG induced an earlier expression of TNF-α mRNA than in M. leprae-infected mice. The numbers of TNF-α-positive cells and apoptotic cells were also enhanced in epithelioid versus non-epithelioid granulomas. As a whole, the data suggest that co-infection of M. leprae-infected mice with BCG modulates TNF-α synthesis which, in turn, leads to induction of protective epithelioid granuloma formation in the foot pads and subsequent mycobacterial clearance. Macrophage differentiation into epithelioid cells, in association with the enhancement of TNF-α production at the granuloma site, may represent a triggering signal that induced apoptosis in these cells, leading to mycobacterial elimination. Moreover, the rate of apoptosis in epithelioid granulomas may well be related to the extent of immunopathologically mediated tissue damage. Dans cette étude, le modèle expérimental de l'infection de la patte de souris de souches BALB/e par Mycobacterium leprae fut utilisé pour évaluer les effets de l'administration de bCG sur la production de tumeur necrosis facteur alpha (TNF-α) et le développement de granulomes. Il a été observé que l'infection par voie intra-veineuse de souris par le BCG. 7 mois après l'inoculation de M. leprae dans leurs pattes, favorisait l'élimination des mycobactérics, comme en témoigne une réduction significative du nombre de d'unités de BCG isolées à partir de la rate et capables de former des colonies, ainsi que du nombre de bacilles acido-alcoolo-résistants (BAAR) dans les pattes. L'infection par le BCG au moment du pic d'infection par M. leprae a entraîné la modification de le réponse granulo- mateuse contre M. leprae, de granulomes à cellules mononucléées à des granulomes à cellules de type ép- ithélioïde. De plus des niveaux sériques plus bas en TNF-α furent détectés chez les souris infectées avec M. leprae seule, comparés aux souris infectées par M. leprae et BCG. Une analyse de l'expression du gène TNF-α dans la rate par transcription inverse-réaction de polymérase en chaîne (RT-PCR) a montré une expression plus précoce de l'ARNm de TNF-α chez les souris co-infectées avec le BCG que chez les souris infectées par M. leprae seule. Le nombre de cellules positives pour TNF-α et de cellules en apoptose était aussi augmenté dans les granulomes de type épithélioïdes en comparaison des granulomes non-épithélioïdes. En conclusion, les données suggièrent que la co-infection par le BCG de souris infectées par M. leprae module la synthèse de TNF-α, qui, en retour, conduit à l'induction de granulomes épithélioïdes protecteurs et à l'élimination des mycobactéries. La différentiation des macrophages en cellules épithélioïdes, en association avec l'augmentation de la production de TNF-α au site des granulomes, pourrait représenter un signal clé pour l'induction de l'apoptose de ces derniers, conduisant à l'élimination des mycobactéries. De plus, le taux d'apoptose dans les granulomes épithélioïdes pourrait bien être relié au degré de dommage tissulaïre à médiation immunopathologique. Se utilizó el modelo de la infeccion de la almo- hadilla plantar del raton BALB/c con Mycobacterium leprae para investigar el efecto del BCG sobre la production de factor de necrosis tumoral alfa (TNF-α) y el desarrollo del granuloma. Se observó que los ratones infectados intravenosamente con BCG, siete meses antes de la inoculacion de M. leprae en la almohadilla plantar, presentaron una eficiente depuracion de M. leprae, una reduccion significativa en el numero de unidades formadoras de colonias de BCG en el bazo, y una reduccion en el numero de bacilos acido- resistentes (BAAR) en la almohadilla plantar. La infeccion con BCG en el pico de infeccion con M. leprae tambien modulo la respuesta granulomatosa a M. leprae al convertir los granulomas mononucleares en granulomas epitelioides. Ademas, los niveles de TNF-α en suero fueron más bajos en los animales infectados con M. leprae que en los animales inoculados con BCG y M. leprae. El análisis por RT-PCR de la expresión del gene TNF-α en el bazo mostro que la expresión de mRNA-TNF-α fue más temprana en los ratones coinfectados con BCG que en los animales infectados sólo con M. leprae. En los granulomas epitelioides se encontraron células TNF-α-positivas y células apoptóticas, en números mayores que los encontrados en los granulomas no epitelioides. Los datos sugieren que la coinfección de los ratones con M. leprae y BCG modula la sintesis de TNF-α, lo cual, a su vez, promueve la formación de granulomas epiteliodes protectores en las almohadillas plantares, y la depuración eficiente de las micobacterias. La diferenciación de los macrófagos en células epitelioides, asociada con cl aumento en la producción de TNF-α en el sitio del granuloma, podría representar un senal induetora de apoptosis en estas células que finalmente también con- duciría a la eliminación de Ias micobacterias. Además, la frecuencia de apoptosis en los granulomas epitelioides podría estar relacionada con el grado de dano tisular mediado pro mecanismos inmunopatológicos. Leprosy is a chronic mycobacterial infection that presents a spectrum of clinical manifestations in which resistance and pathogenesis are mediated by the cell-mediated immune response of the host (22). At one extreme of the spectrum, patients with tuberculoid leprosy demonstrate a resistance response characterized by the formation of epithelioid-cell granulomas that restrict the growth of Mycobacterium leprae. At the opposite extreme of the spectrum, patients with lepromatous leprosy lack the T-cell-mediated immune response, and have diffuse lesions containing macrophages with large numbers of mycobacteria. Many attempts to protect against M. leprae infection have been made with M. bovis BCG. Several studies have shown that BCG vaccination in humans induced a protective immune response against M. leprae infection (5,7). BCG was also shown to induce a strong nonspecific immune stimulatory action against several pathogens and tumor cells in bladder cancer (26-27). In addition, it has been demonstrated that immunotherapy carried out with viable BCG and heat-killed M. leprae led to clinical and bacteriological improvement of lepromatous leprosy and induction of granuloma formation (19-20). Moreover, changes in the immune response that alter the clinical status in leprosy patients, during reactional states are often observed during the natural course of leprosy. However, this acquired immune response against mycobacterial antigens can also be associated with immunopathologically mediated tissue damage with rapid and severe neuritis. The occurrence of reactions indicates that immunomodulatory agents could be an important therapeutic tool in the regulation of cell-mediated immunity in leprosy, although the relationship between im- munopathological response and protective bactericidal immune response has not been completely elucidated. Intracellular mycobacterial elimination and granuloma formation require the differentiation of macrophages into epithelioid cells, the contribution of CD4 and CD8 T lymphocytes, and the production of cytokines such as interferon gamma (IFN-γ) and tumor necrosis factor-alpha (TNF-α) (6). Accordingly, Kindler, et al. (11) have demonstrated that administration of anti- TNF-α antibody in BCG-infected mice prevented the development of epithelioid granulomas that resulted in mycobacteria spreading. In addition, previous studies at our laboratory demonstrated that administration of thalidomide, a selective inhibitor of TNF-α synthesis (25), reduced the number and size of granulomas during BCG infection in mice (1). The process of apoptosis seems to correlate with the elimination of bacteria in phagocytes (15). Apoptosis is an important additional mechanism for regulating the immune response and is partly modulated by TNF-α (16, 29). Interestingly, morphological findings consistent with apoptosis have been seen in the epithelioid cells of tuberculoid leprosy, sarcoidosis, and tuberculosis granulomas (9). The experimental model of M. leprae infection in mouse foot pads developed by Shepard (28) has been used to investigate several aspects of the pathogenesis, immunology, and therapeutics of leprosy in BALB/c mice. M. leprae only grows in the foot pad in limited amounts (106-107), from 6 to 7 months subsequent to infection. The formation of granulomas in situ resembling those found in human lepromatous leprosy is then observed, followed by a complete clearance of the bacteria 12-13 months thereafter (21-28). In a recent study, inhibition of M. leprae multiplication in the foot pad was demonstrated after immunizing mice with the ribosomal fraction from ruptured BCG and its culture filtrate (l4). In this study, the same classical experimental model for M. leprae infection was used to investigate the effect of BCG administration on TNF-α production and granuloma development in mice previously infected with M. leprae. It was observed that co-infection with BCG interfered with TNF-α production locally and systemically, induced the formation of epithelioid granulomas and increased both the number of apoptotic cells at the infection site as well as the rate of M. leprae clearance in the mouse foot pad. Animals. BALB/c female mice, 6 to 8 weeks of age, were used. The animals were divided into three different groups: Group I = Mice whose foot pads were infected with M. leprae; Group II = Mice intravenously infected with BCG; Group III = Mice infected with M. leprae that were intravenously administered BCG at the peak of M. leprae infection (month 7). The mice were housed in plastic cages and had unlimited access to feed and tap water. Necropsy procedure. Mice were ether anesthetized, killed by cervical displacement, and autopsied at predetermined intervals during the course of M. leprae or BCG infection. The feet of M. leprae-infected mice were removed and the foot pads dissected. The left foot pads were fixed in 10% formaldehyde for histopathologic analysis or frozen in liquid nitrogen for immuno-histochemistry to determine the presence of TNF-α protein at the site of M. leprae infection. The right foot pads were used for determination of M. leprae growth during the course of infection. The abdominal cavities were opened aseptically, and the liver and spleen were dissected. Livers were fixed in 10% formaldehyde for histopathologic analysis. Spleens were used for BCG colony forming units (BCG-CFU) counts or for reverse transcription polymerase chain reaction (RT-PCR) analysis. M. leprae infection. The experimental M. leprae infection in mice was performed by the methods described by Shepard (28). Human leproma-derived M. leprae were used as the inoculum. A 6-mm punch biopsy was obtained from lepromatous leprosy patients and used for M. leprae isolation. Only patients who had given their informed consent were enrolled. Skin biopsies were minced with scissors and homogenized in Hanks' balanced salt solution (HBSS). M. leprae recovered from each biopsy was stained by the Ziehl- Nielsen method and counted microscopically under a 1250x magnification with oil immersion in 60 microscopic fields. A suspension containing 5 x 103 acid-fast bacilli (AFB) in 0.03 ml of sterile saline was injected into each mouse foot pad. M. leprae growth was determined at monthly intervals after infection in four animals per time point in two different experiments. The mouse foot pad tissues were minced with sharp scissors, placed in the cup of a Mickle tissue disintegrator containing glass beads, and 2 ml of sterile isotonic saline solution was added. One min of vibration was used with an amplitude of 5 mm. The remaining clumps of tissue were removed by allowing the preparation to settle in a test tube. Ten jul of each suspension was transferred to the circles of a Reich counting slide (Bellco Glass Inc., Vineland, New Jersey, U.S.A.). Each sample was spread with a platinum wire over the surface of a circle. The slides were air dried, fixed by exposure to formalin vapor, and Ziehl-Nielsen stained. AFB counts were performed as described (1250x magnification with oil immersion). BCG infection. Mice were intravenously injected in the dorsal tail vein with 1 x 106 colony forming units (CFU) of viable BCG strain Pasteur 10/11 suspended in 0.2 ml of sterile isotonic saline solution. 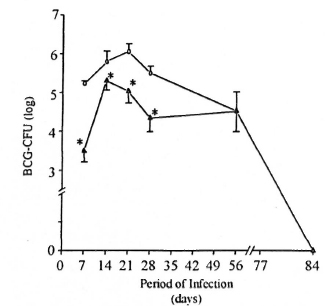 At weekly intervals after BCG infection, BCG-CFU enumeration in the spleen was performed (four animals per time point). Immediately after autopsy, the spleens were homogenized separately in 1 ml sterile saline solution in a teflon-coated tissue homogenizer (Glas-Col Apparatus Co., Terre Haute, Indiana, U.S.A.). Serial 10-fold dilutions were made in saline and plated onto Middlebrook 7H10 Bacto Agar (Difco Laboratories, Detroit, Michigan, U.S.A.) plates. Appropriate dilutions were tested in sextuple. Plates were sealed in plastic bags and incubated at 37°C. The BCG-CFU were counted visually after 14 days of incubation. Group III mice, previously infected with M. leprae, were administered BCG 7 months after M. leprae inoculation. In this study, M. leprae took an average of 7 months to reach the peak of M. leprae infection associated with the presence of inflammatory infiltrate in the mouse foot pads. Histopathology and immunostaining. Paraffin sections of formalin-fixed, left mouse foot pads and liver were stained by hematoxylin and eosin (H&E) for histo- pathological analysis. The number of M. leprae-induced granulomas in the mouse foot pads and BCG-induced granulomas in the liver were counted on 100 microscope fields at l00x magnification. The extension of the inflamed tissue area and the number of TNF-α positively stained cells in the granuloma in the mouse foot pad were investigated in M. leprae-infected mice (N = 4) and M. leprae + BCG mice (N = 4) 21 days after BCG inoculation (peak of BCG infection). Two paraffin sections (5-|am thick) of formalin-fixed tissue were obtained at varying depths from each tissue block. All microscopic fields presenting inflammatory infiltrate were selected, and quantitative measurements (%) of the inflamed area in the mouse foot pads were performed with a Mini-Mop analysis system (Kontron, Germany) during microscopic examination (lOOx magnification) in four mice from each group. Quantitative measurements were expressed as a percent of the inflamed tissue area by tissue section. The presence of TNF-α protein in the M. leprae-induced granulomas in the mouse foot pad was investigated by immuno-histo- chemistry. Frozen sections (5-µm thick) of foot pad tissues were fixed in acetone. The avidin-biotin-peroxidase complex (ABC) procedure was performed. In brief, the sections were incubated with polyclonal rabbit anti-TNF-α antibody (Genzyme, Boston, Massachusetts, U.S.A.) followed by a goat anti-rabbit IgG biotinylated antibody (Dakopatts, Copenhagen, Denmark). Controls for the ABC procedure were performed by replacing anti-TNF-α antibody with normal rabbit serum, or by omitting the anti-TNF-α antibody. Quantitative measurements were expressed as a percent of TNF-α positively stained cells in the granuloma. The sections were analyzed by light microscopy, and photomicrographs were taken with a Nikon Microphot system. In situ detection of apoptosis. Paraffin sections (5-µm thick) of the mouse foot pad tissues were placed on siliconized slides (Perkins-Elmer Cetus, Emeryville, California, U.S.A.). Detection of apoptotic cells was investigated by direct immunoperoxi- dase of digoxigenin-labeled genomic DNA in the foot pads of M. leprae-infected mice (N = 4) and M. leprae + BCG mice (N = 4) 21 days after BCG inoculation. The reaction procedure was performed according to the Apoptag Plus in situ detection kit (Oncor, Inc., Gaithersburg, Maryland, U.S.A.). Briefly, residues of digoxigenin-nucleotide were added to DNA by terminal deoxinucleotidyl transferase (TdT). The incorporated nucleotides formed a random heteropolymer, in a ratio that had been optimized for anti-digoxigenin antibody conjugated with peroxidase binding. Diluted 30% H2O2 in methanol was used to perform the Inactivation of endogenous peroxidase. Diaminobenzidine (DAB) reacted with the labeled cells to generate a colored substrate at the site of DNA fragmentation. Counterstaining with methyl green was performed and the morphology as well as DAB staining were used to interpret the results. Control of the procedure was obtained by using histological sections of rat mammary glands (positive control) or by omitting the anti-digoxigenin antibody (negative control). Quantitative measurements were expressed as a percent of apoptotic cells in the granuloma. TNF-α measurement. Serum TNF-α levels were investigated in the different groups of mice at the peak of M. leprae infection (month 7), and weekly after BCG infection. For serum collection, mice were ether anesthetized and bled by orbital puncture. Blood was allowed to clot at room temperature, and serum was aliquoted and stored at -70°C until use. The TNF-α concentration in the serum samples was determined by using a TNF-α-specific ELISA (Endogen Inc., Boston, Massachusetts, U.S.A.) as recommended by the manufacturer. Each sample was tested in duplicate, and the detection limit of the assay was 4 pg/ml. RT-PCR analysis. TNF-α mRNA expression in the spleen was investigated in different groups of mice at the peak of M. leprae infection (month 7) and at 7, 14, 21, and 28 days after BCG infection. Healthy mice were used as controls in the experiment. Spleens of mice were collected and stored in liquid nitrogen until used. Fragments (25 mg) of spleen were homogenized in 3 ml Trizol (GIBCO BRL, Gaithersburg, Maryland, U.S.A.) and RNA was extracted and purified according to the manufacturer's instructions. Purified RNA was analyzed by 1.2% formaldehyde- agarose electrophoresis gel for the evaluation of RNA integrity. Following quantitation, 1 µg of total RNA was reverse transcribed into cDNA as previously described (23). Cytokine-specific oligonucleotide primer pairs for mouse TNF-α were kindly donated by Dr. G. M. B. Pereira (Leprosy Laboratory, Oswaldo Cruz Foundation, Brazil) and those for (β-actin were purchased (Stratagene Cloning System, La Jolla, California, U.S.A.). Primer sequences (5' and 3') were as follows: TNF-α, AGAAAAGCAAGCAGCCAACCAGGCA, GGGGGCTCTGAGGAGTAGACAATAA; (β-actin, TGTGGCCGCTCTAGGCACCA, CGGTTGGCCTTAGGGTTCAGGGGGG. PCR conditions were performed as indicated (23), and the samples amplified in a DNA thermocycler 480 (Perkin-Elmer) for 35 cycles of denaturation at 94°C for 45 sec, annealing at 60°C for 45 sec, and extension at 72°C for 1.5 min. Following electrophoresis on 1.7% agarose gels, PCR products were transferred to Hybond-N nylon membranes (Amersham Corp., Arlington Heights, Illinois, U.S.A.), and hybridized with a radioactive oligonucleotide probe complementary to sequences internal to those recognized by the specific primers. Sequences of the probes were: TNF-α, AAACCCTGGTATGAGCCCA; [β-actin, GGTGGGAATGGGTCAGAAGG. The primers were RNA specific in that both the 5' sense and 3' antisense primers spanned the junctions of two exons, thus precluding amplification of genomic DNA. Densitometer analysis was performed by scanning the images from autoradiographs using an imaging densitometer (Bio-Rad Laboratories, Hercules, California, U.S.A.). Densitometric values for each band were established by Molecular Analyst Software 1.2 (Bio-Rad Laboratories). The relative amount of PCR product present in an individual sample was expressed as a percentage relative to the most intense band, that band being assigned the value of 100. To make sure that the samples contained identical quantities of cDNA, β-actin was used to normalize the exact levels of input cDNA present among the different samples tested. Statistical analysis. Data on M. leprae counts in mouse foot pads, BCG-CFU in the spleens, and TNF-α serum levels were compared using the Mann-Whitney two- sample rank sum test. The number of granulomas in the foot pads, TNF-α positively stained cells (%), apoptotic cells (%), and quantitative measurements (%) of the inflamed tissue area were compared using the Student's t test. The significance level adopted was p <0.05. Both S.D. (standard deviation) and S.E.M. (standard error of the mean) were used to express variance. Induction of M. leprae clearance by BCG infection. The number of M. leprae (AFB staining) in the mouse foot pads was investigated during the course of infection. Similar to what was observed in Shepard's landmark study (1960), the growth of M. leprae in these animals (BALB/c mice, Group I) was very slow. The resulting limited infection after inoculation of 5 x 103 microorganisms was preceded by a lag phase of approximately 60 days, followed by a logarithmic growth (exponential phase) which, after 6-7 months, yielded 106-107 M. leprae per foot pad (peak of infection). This was followed by a stationary phase (plateau phase) in which the number of bacteria remained more or less constant (between 7 to 10 months of infection) until the total clearance of M. leprae observed from 12 to 13 months later (Fig. 1). Interestingly, in Group III mice BCG inoculation at the peak of M. leprae infection led to an accelerated clearance of M. leprae in the mouse foot pad. The plateau phase was not observed in these animals, and complete clearance of M. leprae took place at month 11. Fig. 1. Effect of BCG administration on M. leprae growth curve in BALB/c mice. Animals were infected in the foot pad with M. leprae alone ( = Group I mice) or co-infected with BCG intravenously ( = Group III) at the peak of M. leprae growth (month 7, arrow). Bacterial growth was then periodically evaluated during M. leprae infection. At the times indicated, foot pads were recovered and bacterial counts performed as described in the Materials and Methods section. Results are reported as mean AFB counts (number of M. leprae per foot pad) ± S.D. of two individual experiments (four animals were assayed per data point in each experiment). * Differences in M. leprae counts were found to be significant when compared to Group I mice. Effect of BCG infection on M. leprae- induccd granulomas. At the peak of M. leprae growth (Group I), a diffuse mononuclear cell infiltrate associated with granulomas could be seen in the foot pads. Two histological types of granulomas were then observed. Small granulomas were formed by the accumulation of macrophages and lymphocytes (Fig. 2A); whereas epithelioid granulomas presented a well-developed structure in which central mononuclear cells showed high levels of epithelioid-cell differentiation surrounded by immature macrophages and cuffs of lymphocytes. Necrosis areas were not observed. Following M. leprae clearance (month 13), no histological lesion was noted (not shown). Interestingly, BCG administration in the M. leprae-infected mice (Group III) altered both the extension of the inflamed tissue and the number of epithelioid granulomas in the foot pad. Quantitative measurements (%) of the inflamed tissue area showed that mice from Group III (day 21 after BCG inoculation) presented a significantly (p <0.05) larger area of inflammation (mean ± S.D. = 16.5 ± 0.5%) than did Group I mice (mean ± S.D. = 8.4 ± 2.7%). Furthermore, around 70% of the granulomas in Group III animals were classified as epithelioid granulomas (Fig. 2B) as compared to 30% in Group I mice (p <0.05). Accordingly, analysis of the expression of TNF-α protein detected at the site of granuloma development (Fig. 2C) showed a higher number (p <0.05) of TNF-α positively stained cells in epithelioid granulomas (mean ± S.D. = 50 ± 5%) than in non-epithelioid granulomas (mean ± S.D. = 20 ± 2.5%). Therefore, a higher number of TNF-α-positive cells was detected in the foot pads of Group III mice. Fig. 2. Histological comparison of foot pads from M. leprae-'mfeclcd mice (Group 1) and M. leprae + BCG- infected mice (Group III). A = presence of diffuse granulomatous inflammation in mouse foot pads (Group I) (H&E; bar = 20 µm). B = Epithelioid granuloma in mouse foot pads from Group III mice (H&E; bar = 20 µm). Inset = Presence of epithelioid cells (H&E; bar = 10 µm). C = Positive staining of TNF-α into an epithelioid granuloma in the mouse foot pad (Group III) (Bar = 10 µm). Inset = Higher magnification of TNF-α-positive cells (Bar = 5 µm). D = Detection of inflammatory apoptotic cells in an epithelioid granuloma in the foot pads of Group III mice (arrows = apoptotic cells; bar = 5 µm). Staining for fragmented DNA (3'-OH DNA ends), a hallmark of apoptosis, revealed the presence of apoptotic cells in the mouse foot pad granuloma (Fig. 2D). Most of the apoptotic nuclei were pyknotic and roughly rounded or oval in shape. Epithelioid granulomas presented a greater number (p <0.05) of apoptotic cells (mean ± S.D. = 30 ± 3%) than non-epithelioid granulomas (mean ± S.D. = 15 ± 1%). Moreover, two different patterns of distribution for apoptotic cells were noted. Cuffs of apoptotic cells were often detected in epithelioid granulomas in contrast to the diffuse distribution found in the non-epithelioid granulomas. Evolution of BCG infection in mice previously infected with M. leprae. The number of BCG-CFU in the spleen was investigated during the course of BCG infection. In the present study, the evolution of BCG infection (Group II animals) was similar to that previously described by other investigators (l7). 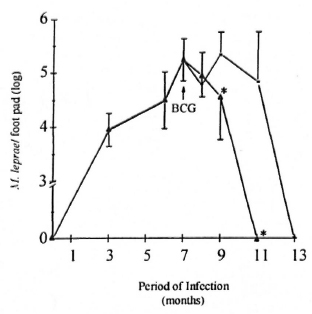 Thus, the progressive increase in BCG-CFU clearly perceived as soon as 7 days after BCG inoculation persisted up to 21 days and began decreasing after 28 days (Fig. 3). In contrast, the number of live BCG recovered from the spleen of M. leprae/BCG-infected mice (Group III) was always very low. At 7, 14, 21, and 28 days after BCG inoculation, the number of BCG-CFU in the spleens of Group III mice was significantly lower (p <0.05) than that observed in Group II mice (Fig. 3). As regards the liver, animals from Group III presented a higher number of BCG-induced granulomas (p <0.05) than the Group II animals (data not shown). Fig. 3. Evaluation of BCG-CFU during the evolution of BCG infection in BCG- and M. leprae/BCG- infected mice. Co-infected animals ( ) are those infected with BCG intravenously 7 months after M. leprae injection in the foot pad (at the peak of M. leprae growth). Another group of animals was infected with BCG alone ( ), and bacterial growth evaluated weekly during BCG infection. At the indicated times, spleens were recovered and bacterial counts (BCG-CFU) performed, as previously described. Data represent mean ± S.D. of BCG-CFU enumeration (four animals per data point) from two separate experiments. * = Significant differences (p <0.05) were noted in BCG-CFU at 7, 14, 21, and 28 days after BCG inoculation in co-infected mice (Group III) when compared to BCG-in- fected mice (Group 11). Detection of TNF-α in sera and cytokine mRNA expression in spleen. TNF-α levels in the serum of infected animals were investigated by ELISA. The kinetic of TNF-α secretion in BCG-negative and BCG-positive M. leprae-infected mice is shown in Figure 4. 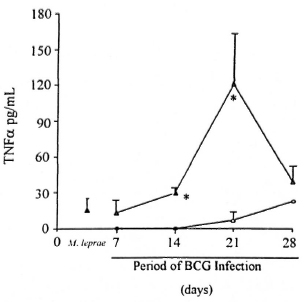 Mice infected only with BCG (Group II, 4 animals per data point) did not present detectable TNF-α in the serum until day 21 of infection (mean ± S.E.M. = 7.0 ± 5.0 pg/ml). Moreover, low TNF-α levels (mean ± S.E.M. = 20.8 ± 8.2 pg/ml) were also detected in most mice infected only with M. leprae (Group I, N = 9); whereas higher TNF-α levels were seen in animals infected with M. leprae + BCG (Group III, N = 4 per data point). A significant difference (p <0.05) in the mean TNF-α values was noted 14 and 21 days after BCG infection when Groups II and III were compared. Mean TNF-α ± S.E.M. were 0 versus 29 ± 4 pg/ml and 7 ± 5 versus 121 ± 42 pg/ml, respectively. Fig. 4. Levels of TNF-α in the serum of mice infected with mycobacteria. BALB/c were infected with either BCG alone ( , Group II mice), M. leprae ( , Group I), or BCG + M. leprae ( , Group III) as described. Serum samples were collected from these animals at month 7 of M. leprae infection and 7, 14, 21, and 28 days after BCG inoculation. Kinetic TNF data are mean TNF (pg/ml) ± S.E.M. from quadruplicates per data point of one representative experiment. * = Significant difference (p <0.05) in mean TNF values of Group III mice when compared to Group II animals. Group I, N = 9. Analysis of TNF-α mRNA expression in the spleen from infected mice was also performed. The kinetic of cytokine gene expression was evaluated in the same groups (Groups II and III) at 7, 14, 21 and 28 days following BCG injection. In addition, a control group (healthy animals) and a M. leprae-infected group (animals analyzed at the peak of M. leprae growth) were also assayed. 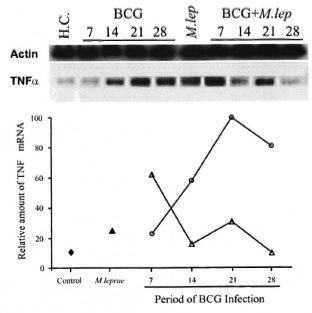 As demonstrated in Figure 5, a differentiated pattern of TNF-α mRNA expression was observed after BCG infection when mice from Groups II and III were compared. The graphic representation of the relative amounts of the TNF-α gene indicates that, in the BCG group (Group II), TNF-α gene expression in the spleen was enhanced during the infection period and showed maximal expression at day 21, thereby confirming previous observations (11). Surprisingly, in the BCG + M. leprae group (Group III) an early expression of the TNF-α gene was observed at day 7 of BCG infection, which became enhanced again at day 21, and at day 28 returned to background levels. Fig. 5. Semi-quantitative RT-PCR analysis of TNF-α mRNA expression in spleens of mycobacteria- infected mice. TNF-α gene expression was investigated in different groups of mice at the peak of M. leprae infection (month 7 for Group I) and at 7, 14, 21, and 28 days after BCG infection (Groups II and III). Lane 1 = Healthy control mice ( ); lane 6 = Group I mice ( ): lanes 2-5 = Group II mice ( ); lanes 7-10 = Group III mice ( ). Total RNA obtained from the spleen was reverse transcribed and the cDNA normalized to yield equivalent P-actin products. The relative amount of TNF-α mRNA was compared among samples from each group of animals and assessed as a percentage of the most intense band. Data from one representative experiment for each group is shown. Groups I, II, and III were defined as mentioned above. H.C. = Healthy control, M. lep = M. leprae-infected mice (Group I). Several studies have demonstrated that BCG vaccination and immunotherapy with heat-killed M. leprae plus BCG, used as an adjunctive to multidrug therapy in leprosy, is responsible for both a histopathological shift of polarity toward the tuberculoid end of the spectrum and a clinical upgrading (reversal) reaction in multibacillary leprosy patients (4, 5, 19, 20). It has been demonstrated that upon BCG vaccination, household contacts of leprosy patients presented positive, proliferative, T-cell responses as well as high interleukin-2 (IL-2) and IFN-γ production to several mycobacterial antigens in vitro (5). A characteristic Th I -type of response found to be associated with a self-healing case of tuberculoid leprosy precipitated by BCG vaccination (Sarno, E. N.; personal communication) has also been observed. In this study, it has been demonstrated that systemic BCG administration at the peak of M. leprae infection modified the evolution of the immune inflammatory response initially induced by M. leprae in the mouse foot pad, and that co-infected mice presented a more effective clearance of M. leprae. Additionally, histopathological analyses have shown that BCG administration influenced the granulomatous response to M. leprae by converting mononuclear cell granulomas into epithelioid-cell granulomas with an enhanced number of apoptotic cells and extension of the inflamed tissue area in the foot pads. In vivo studies of mycobacterial-induced granulomas have suggested that TNF-α plays a crucial role in granuloma formation (6, 10, 11). M. leprae, BCG, and several of their bacterial components have been shown to induce TNF-α secretion by monocytes in vitro (3, 24). In the present study, a series of observations indicated that the increased TNF-α production in this co-infection model correlated with a high degree of granulomatous inflammation (expressed by an extensive inflamed tissue area and number of epithelioid granulomas) in the foot pads of the infected mice: a) the increased number of TNF-α-positive stained cells observed in epithelioid as compared to non- epithelioid granulomas; b) enhanced serum TNF-α levels were detected only in Group III mice; and c) the difference in the kinetic expression of TNF-α mRNA in the spleen of co-infected animals. Likewise, it has been demonstrated that BCG administration in BCG-susceptible mice (C57BL/6, BALB/c and B10.A) generated an efficient protective response to the challenge with homologous BCG and heterologous pathogens, such as hysteria monocytogenes (l7). BCG-induced restriction of M. avium proliferation and enhanced expression of TNF-α and IFN-γ mRNA in spleen cells have been described as well (2), suggesting that these cytokines can act in an additive or synergistic fashion in the induction of bacteriostasis. We have herein shown similar results. Interestingly, the accelerated process of bacterial elimination in co-infected mice (Group III) was also expressed by the reduction of BCG-CFU in the spleen (Fig. 3). Furthermore, our preliminary data indicated that BCG administration to these animals induced the early expression of IFN-γ mRNA (data not shown) in addition to TNF-α. In Group III mice, an early expression of the TNF-α gene was observed at day 7 of BCG infection. It is possible that this early expression of TNF-α mRNA in the spleens is associated with the higher detection of TNF-α protein in the serum at day 21 when compared with Group I mice. In addition, BCG-infected mice (Group II) presented progressive increases of TNF-α mRNA and TNF-α serum levels. Interestingly, Groups II and III mice showed an early expression of TNF-α mRNA when compared with TNF-α serum levels. The present data also suggest that there is a correlation between TNF-α serum levels or TNF-α mRNA in the spleen with the augmented TNF-α production and development of epithelioid granulomas in the foot pads of Group III mice. However, further studies are needed to more fully investigate these findings. A higher number of apoptotic cells was noted in the epithelioid granulomas from the co-infected animals. It is possible that the enhanced rate of apoptosis in the epithelioid granulomas is associated with the higher expression of TNF-α in situ and to a more effective bacterial elimination in the foot pads of the Group III mice. Cree, et al. (8, 9) have suggested that apoptosis may exceed mitosis as a cause for the rapid turnover of granulomas, which is probably associated with the fact that mycobacteria are generally not observed in epithelioid granulomas. However, the ability of BCG to induce or prevent apoptosis in mononuclear phagocytic cells remains controversial. It was recently demonstrated that BCG infection of resting human monocytes prevented apoptosis, and that this effect was accompanied by the induction of the A1 anti-apoptotic gene expression (13). On the other hand, it has also been observed that in vitro and in vivo M. tuberculosis-induced apoptosis of mononuclear phagocytes could be mediated by downregulation of the bcl-2 gene (l2). These data suggest that BCG administration in M. leprae-infected mice modulates the synthesis of TNF-α in situ and leads to the induction of protective granuloma formation and subsequent mycobacteria clearance. It may also be possible that apoptosis plays a role in the relationship between the immunopathological response and the development of protective granulomas containing bactericidal macrophages differentiated into epithelioid cells. Acknowledgment. We would like to thank J. A. C. Nery, attending physician of the Leprosy Out-Patient Unit, Oswaldo Cruz Foundation, and R. B. Oliveira for the graphics. Thanks are also due to H. Ferreira, V. F. Filho, and V. C. Valentino for technical assistance; to E. R. Leite for her efficient secretarial support, and to Mrs. Judy Grevan for editing help. F. M. Aarestrup's work was financed by CAPES (Brazil), CNPq (Brazil), and by FAPEMIG (Brazil) (grant number CBS- 1352/97). 1. Aarestrup, F. M., Gonçalves-da-Costa, S. C. and Sarno, E. N. The effect of thalidomide on BCG-induced granulomas in mice. Braz. J. Med. Biol. Res. 28 (1995) 1069-1075. 2. Appelberg, R., Castro, A. C., Pedrosa, J., Silva, R. A., Orme, I. M. and Minôprio, P. Role of gamma interferon and tumor necrosis factor alpha during T-cell-independent and -dependent phases of Mycobacterium avium infection. Infect. Immun. 62 (1994) 3962-3971. 3. Barnes, P. F., Chatterjee, D., Brennan, P. J., Rea, T. H. and Modlin, R. L. Tumor necrosis factor production in patients with leprosy. Infect. Immun. 60 ( 1992) 1441 -1446. 4. Chaudhury, S., Hajra, S. K., Mukerjee, A., Saha. B., Majumdar, V., Chattapadhya, D. and Saha, K. Immunotherapy of lepromin-negative borderline leprosy patients with low-dose Convit vaccine as an adjunct to multidrug therapy; a six- year follow up study in Calcutta. Int. J. Lepr. 65 (1997) 56-62. 5. Chaudhury, S., Hazra, S. K., Saha, B., Mazumder, B., Biswas, P. C., Chattopadhya, D. and Saha, K. An eight-year field trial on antileprosy vaccines among high-risk household contacts in the Calcutta metropolis. Int. J. Lepr. 62 (1994)389-394. 6. Chensue, S. W., Warmington, K., Ruth, J., Lincoln, P., Kuo, M.-C. and Kunkel, S. L. Cytokine responses during mycobacterial and schistosomal antigen-induced pulmonary granuloma formation; production of Thl and Th2 cytokines and relative contribution of tumor necrosis factor. Am. J. Pathol. 145 (1994) 1105-1113. 7. Convit, J. P., Smith, G., Zuniga, M., Sampson, C., Ulrich, M., Plata, J. A., Silva, J., Molina, J. and Salgado, A. BCG Vaccination protects against leprosy in Venezuela; a case-control study. Int. J. Lepr. 61 (1993) 185-191. 8. Cree, I. A., Gardiner, C. A., Beck, J. S. and Mehta, J. Studies of cell death (apoptosis) and cell division in leprosy granulomas. Int. J. Lepr. 54(1986) 607-613. 9. Cree, I. 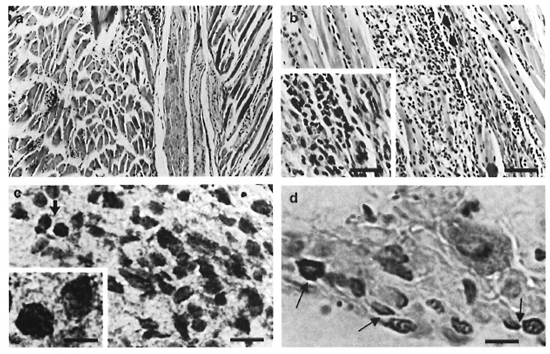 A.. Nurbhai, S., Milne, G. and Beck, J. S. Cell death in granulomata: the role of apoptosis. J. Clin. Pathol. 40 (1987) 1314-1319. 10. Garcia, I., Miyazaki, Y., Marchal, G., Lesslauer, W. and Vassalli, P. High sensitivity of transgenic mice expressing soluble TNFR1 fusion protein to mycobacterial infections: synergistic action of TNF and IFNy in the differentiation of protective granulomas. Eur. J. Immunol. 27 (1997) 3182-3190. 11. Kindler, V., Sappino, A. P.. Grau, G. E., Piguet, P. F. and Vassali, P. The inducing role of tumor necrosis factor in the development of bactericidal granulomas during BCG infection. Cell 56 (1989) 731-740. 12. Klinger, K., Tchou-Wong, K. M., Brandli, O., Aston, C., Kim, R., Chi, C. and Row, W. N. Effects of mycobacteria on regulation of apoptosis in mononuclear phagocytes. Infect. Immun. 65 (1997)5272-5278. 13. Kremer, L., Estaquier, J., Brandt, E., Ameisen, J. and Locht, C. Mycobacterium bovis bacillus prevents apoptosis of resting human monocytes. Eur. J. Immunol. 27 (1997) 2450-2456. 14. Matsuoka, M., Nomaguchi, H., Yukitake, H., Ohara, N., Matsumoto, S., Mise, K. and Ya- mada, T. Inhibition of multiplication of Mycobacterium leprae in mouse foot pads by immunization with ribosomal fraction and culture filtrate from Mycobacterium bovis BCG. Vaccine 15 (1997) 1214-1217. 15. Molloy, A., Laochumroonvoporang, P. and Kaplan, G. Apoptosis, but not necrosis, of infected monocytes is coupled with killing of intracellular bacillus Calmette-Guerin. J. Exp. Med. 180(1994) 1499-1509. 16. Munn, D. H., Beall, A. C., Song, D., Wrenn, R. W. and Throckmorton, D. C. Activation-induced apoptosis in human macrophages: developmental regulation of a novel cell death pathway by macrophage colony-stimulating factor and interferon-γ. J. Exp. Med. 181 (1995) 127-136. 17. Pelletier, M., Forget, A., Bourassa, D., Gros, P. and Skamene, E. Immunopathology of BCG infection in genetically resistant and susceptible mouse strains. J. Immunol. 129 (1982) 2179-2218. 18. Ponnighaus, J. M., Fine, P. E. M., Sterne, J. A. C., Wilson, R. J., Msosa, E., Gruer, P. J. K., Jenkins, P. A., Lucas, S. B., Liomba, N. G. and Bliss, L. Efficacy of BCG vaccine against leprosy and tuberculosis in northern Malawi. Lancet 14 (1992) 636-639. 19. Rada, E., Ulrich, M.. Aranzazu, N., Rodriguez, V., Centeno, M., Gonzalez, I., Santaella, C., Rodriguez, M. and Convit, J. A follow-up study of multibacillary Hansen's disease patients treated with multidrug therapy (MDT) or MDT + immunotherapy (IMT). Int. J. Lepr. 65 (1997) 320-327. 20. Rada, E., Ulrich, M., Aranzazu, N., Santaella, C., Gallinoto, M., Centeno, M., Rodriguez, V. and Convit, J. A longitudinal study of immunologic reactivity in leprosy patients treated with immunotherapy. Int. J. Lepr. 62 (1994) 552-558. 21. Rees, R. J. W. Animal models in leprosy. Br. Med. Bull. 44 (1988) 650-663. 22. Ridley, D. S. and Jopling. W. H. Classification of leprosy according to immunity; a five-group system. Int. J. Lepr. 34 (1966) 255-273. 23. Sampaio, E. P.. Moraes, M. O., Nery, J. A. C., Santos, A. R., Matos, H. C. and Sarno, E. N. Pentoxyifylline decreases in vivo and in vitro tumor necrosis factor-alpha (TNFa) production in lepromatous leprosy patients with erythema nodosum leprosum (ENL). Clin. Exp. Immunol. 11 (1998) 300-308. 24. Sampaio, E. P., Moreira, A. L., Sarno, E. N., Malta, A. M. and Kaplan, G. Prolonged treatment with recombinant interferon-γ induces erythema nodosum leprosum in lepromatous leprosy patients. J. Exp. Med. 175 (1992) 1729-1737. 25. Sampaio, E. P., Sarno, E. N., Galilly, R., Cohn, Z. A. and Kaplan, G. Thalidomide selectively inhibits tumor necrosis factor-α production by stimulated human monocytes. J. Exp. Med. 173 (1991) 699-703. 26. Sasaki, A.. Kudoh, S., Mori, K., Takahashi, N. and Suzuki, T. Are BCG effects against urinary bladder carcinoma cell line T24 correlated with apoptosis in vitro? Urol. Int. 59 (1997) 142-148. 27. Sharples, C. E., Shaw, M., Castes. M., Convit, J. and Blackwell, J. M. Immune response in healthy volunteers vaccinated with BCG plus killed leishmanial promastigotes; antibody responses to mycobacterial and leishmanial antigens. Vaccine 12 (1994) 1402-1412. 28. Shepard, C. C. The experimental disease that follows the injection of human leprosy bacilli into foot-pads of mice. J. Exp. Med. 3 (1960) 445-454. 29. Wesslborg, S., Janssen, O. and Kabelitz, D. Induction of activation-driven death (apoptosis) in activated but not resting peripheral blood T cells. J. Immunol. 150(1993)4338-4345. 1. D.D.S., Ph.D.; Laboratory of Immunology, Department of Parasitology, Microbiology and Immunology, Institute of Biological Sciences, Federal University of Juiz de Fora, Campus Universitário UFJF, Juiz de Fora, Minas Gerais, Brazil 36036033 and Leprosy Laboratory, Oswaldo Cruz Institute, Rio de Janiero, Brazil. 2. Leprosy Laboratory, Oswaldo Cruz Institute, FIOCRUZ, Avenida Brasil 4365, Manguinhos, Rio de Janeiro, R.J.. Brazil 21045-900. Received for publication on 25 April 1999. Accepted for publication in revised form on 6 March 2000.